His eyes burnt beneath his heavy eyelids as he tried weakly to open them. He gave up and took a couple of shallow breaths as he struggled to regain his composure. He wondered where he was and for a brief moment, who he was. Slowly his fogged mind began to feel its way through the murky clouds and he began to remember things in snatches. His thoughts were slow, he could almost watch the ghosts of his mind as the thoughts struggled to float to the surface. Dimly a thought stuck in his mind and he knew for certain that he was on drugs. Some kind of chemical was sloshing around in his mind, his essence was intermixed with a narcotic. He groaned to himself, the sound echoed painfully through his skull and reverberated in his ears. His muscles were numb and lifeless as he tried to move. Suddenly a jolt of pain attacked him, a coursing surge of agony tightened around his chest and shoulders as his aching muscles flexed slightly. He tried again to open his eyelids but it was as if they were sewn together, bonded skin to skin and immobile. He fought on, a tiny battle in a war that had lost all definition. His vision blurred as light poured in like needles sending pain shooting through his mind. He groaned as his body slowly fought its way towards consciousness and it felt like he was clawing to the sun through a thick covering of ice. He flicked his eyes open against the pain of the brilliant white light that permeated his very being. Above him was a blurred black shape, a face perhaps. It looked down on him with thoughts of its own and moved slightly, fazing in and out of his field of vision. He blinked twice and the tears began to clear, the room swam lazily into focus. The face appeared again, gazing down on him. He recognised the face, a friendly smile and warm eyes, lit up from a deep well of compassion within. He relaxed, knowing he was safe. "Ensign Rogers…" He groaned weakly, his throat burning and dry, his voice a painful rasp. "Just relax." She told him. "You’ve had an accident but you’re safe now." He did just that. He closed his eyes and tried to make sense of things. An accident? That would explain the pain and the numbness would be the chemicals trying to block his feelings and aid the healing of his damaged body. The last few seconds ran through his mind again and something wasn’t right, the look in her eyes, the expression on her face maybe. "How do you feel?" Another voice cut into his thoughts. "I’ll live…" He managed to croak. With an effort he managed to open his eyes and move his head until he found the Doctors face. "Right?" He asked. "You’ll be fine." She assured him with a wide smile. "Captain Graves?" The other voice asked again. "If you say so…" He groaned, his throat tightening slightly from the exertion. "Captain, we need to talk about something." Blake told him. "Do you feel up to it?" John Graves blinked his eyes open and gazed up at the two faces that gazed back down on him. Captain Girling’s expression was devoid of the normal light humour he usually had, the tolerance and wide latitude he extended to the merchants seemed to have ended. He knew that this was serious. "Ok." He replied awkwardly, the pain and discomfort slipping to the back of his mind for a moment. "You know?" He started, turning weakly to see her. "I’m afraid so." Blake agreed. "We have some questions." "The accident?" Graves sighed. "My fault?" "Yes!" Blake nodded. "We think so." "But we know!" Katherine added. "About your secret." "Ah!" He moaned and fell back to the soft comfort of the bio-bed. "I have to ask!" Blake told him. "It’s my responsibility to ask." "I understand." Graves sighed. "Actually it might be a relief." "Now isn’t the time." Blake said finally, resting a supportive hand on the merchant Captain’s shoulder. "We’ll talk tomorrow." "Blake!" He grunted, wincing as the effort of speaking loudly sent a jolt of pain shooting through his temples. "Will you have to tell my crew?" He groaned thinly, almost pleading. "We’ll need to talk." Blake told him. "I won’t do anything until I hear your side of this!" Commander Winston Morrow and Haldo Compz stepped into the briefing room at the rear of the spacious Wanderer bridge complex. "How comes you’re over here?" Morrow asked conversationally. "I thought you virtually lived on the Corinthian these days." "I thought you lived at the bottom of a bottle." Haldo replied with disinterest. "But then here you are sober. What do any of us know?" "I was just saying…" Morrow grumbled moodily. "I’m just tired." Haldo replied in a tone approaching an apology but falling just short as he rubbed his temples wearily. "I had a long day yesterday and no sleep yet." "It’s ok." He told him without much sincerity. "Not enjoying your work on the Corinthian then?" "I’d have a better time if Captain Graves didn’t decide to test your shuttles by flying them into an ion-storm." Haldo huffed in annoyance. "He just didn’t know how to detect them." Morrow explained. "He isn’t used to that type of control system, his going out was my idea, I thought it would be good to familiarise himself with the new technology." "Then I can blame you." Haldo sneered. "I missed both of my lunches while we were out rescuing him!" "I’m sure he feels worse about it than you do." Morrow told him pointedly as the door slid closed behind them. They looked up to see Blake and Katherine sitting at the briefing table with Captain Graves at the head, his hands knotted together before him and his expression grim. "Please sit down." Graves said with a note of stoic formality as he gestured towards the chairs. "I’ve asked you here because I have to tell you all something." He began with a sigh. "What’s the matter?" Commander Morrow asked, his eyes widening with a hint of nervousness. "Winston." Graves looked over. "You’ve been my friend for more years than I would care to count, I needed you to finally hear this." "Now I’m worried." Morrow averted his eyes and frowned deeply. "Blake has to be here, what I tell him will leave him with a difficult decision to make." Graves sighed, lost in his own wandering thoughts. "I asked for Katherine to be here as well because she knows something and I need her to know the story behind it." Katherine nodded to him with a slight supportive smile. "And Haldo." He looked over to the pale engineer whose face didn’t have the mocking expression of self-important superiority he normally had. "I’ve learnt to trust your judgement and would just like your insight into what I’m going to tell you." "I’ve never had a problem voicing my opinions…" Haldo joked awkwardly, sensing the gravity of the situation. "Where to begin…?" He smiled to himself. "Take your time." Blake told him. "I’m not John Graves…" He sighed, the words tumbling out as he could think of no better way to put it, no prettier way to present the basic facts. "What?" Morrow gasped. "Of course you are!" "It’s a long story…" He smiled emptily as he began. "I suppose I had better start at the beginning..."
He gazed emptily across the table to the others as he began his story. "It was a long time ago. More than a century when it all started with my father, way before I was born…"
It was the year 2269 along the rim of the neutral zone at the outskirts of the Federation exploration treaty zone heading towards the Romulan border. A small craft was making its way to a small colony that was within their space but not yet a full member of the Federation. At the helm of the boxy craft was Commander Peter Graves while Ensign Carol Peterson sat behind in the large flight control room quietly watching the ships basic instruments and working listlessly on her report. The craft was taking computer files to the Baggon 5 colony, simple documents that held the Federation historical data files, the membership declaration requirements and other items of interest to a people seeking alignment. The colony was an independent place from their native species as their kind had travelled into space thousands of years before when their sun had threatened their world and now the tiny outpost which had once been had flourished into a prosperous world of its own. "What do you make of the Baggons?" Peter began conversationally after checking the course and the computer replying that nothing in the next few hundred thousand light years could possible cause any interest to them. "I’ve never met one." She sat up from her rather irritating report that merely outlined her downloading of the files to the ships computer. "I hear they’re ideally suited to Federation membership, we’ll be glad to have them." "They’re a lovely, friendly people with a rich and diverse culture." He agreed with a smile, rotating his chair to face her. "I’ve read through their history, they didn’t even have a word for war." "Well isn’t it nice than we are able to add some ethnic diversity to their way of thinking." She replied sarcastically. "You aren’t enjoying this assignment, Ensign?" He grinned, his right leg crossed over and he folded his arms over his chest, his question sounding more like an instruction. "It wasn’t my first choice, sir." She explained with a sigh of dubious resignation. "I had applied for the Enterprise." "The Enterprise?" Commander Graves nodded knowingly. "Most of the cadets out of Starfleet academy apply for that ship. Most never get it, fewer still will now she’s in refit for the next few years." "I heard about that." She grumbled. "They’re stripping her down to the bones to plan a whole new class of ships based on what they can learn from the stresses to her structure. They’re going to rebuild her based on what they find." "You wanted to join the engineering team?" He continued. "At first, I had exceptional grades in my engineering classes!" She replied with a shrug. "My tutor told me I had an excellent chance of getting a permanent assignment there." "I see." He unfolded his arms and turned back to the large transparency at the head of the boxy cockpit. "So your career begins with the dubious honour of being turned down by Kirk himself!" "Yes Sir." She grumbled, flashing her commanding officer an acidic glance. "I suppose that if you have to be turned down then there’s nobody better to be rejected by…"
"Starfleet isn’t all about glory." He turned again to face her with a slightly more open gesture. "Have you ever thought that what we’re all about isn’t battling Klingons and Romulans and saving the galaxy? Maybe what Starfleet is really all about is the wonder of exploring space and discovering more about our place in the universe?" "No sir." She admitted sarcastically. "Frankly it hadn’t." "Perhaps that’s why Kirk rejected you." The Commander grinned at her. "Sir?" She snapped up with a look of being slightly hurt. "He has a bit of a reputation." He shrugged. "I met him a few times, believe me he deserves it." Ensign Peterson lost all interest in her report that held only a tiny amount of her interest in any case. She glared at the young Commander. He was in his late twenties with a mop of light brown hair and a generous build. "He’s no fool." He explained. "His legend has grown around the gung-ho stories but he’s a very calculating man, he knows the value of exploration and he tends to surround himself with a crew who feels the same way." "Do you honestly believe that he rejected me for that?" She asked, her face a grimace as she began to wonder. "For being immature?" He nodded in agreement. "I suppose I never thought of it that way…" She frowned, nodding gently to herself as the thought, which while unpleasant made a lot of sense. "I imagine that’s why you’re here." He smiled. "Work like this will open your eyes to the real work of Starfleet instead of the romantic notions you have. Maybe a few years of this will prepare you to reapply to take a position aboard the Flagship of the fleet." "Maybe…" She agreed grudgingly, turning back to her computer screen. "Perhaps you’ll get lucky!" He joked as he set the sensors to scan forward the greatest distance they could manage. "Bad things have been known to happen on board courier ships!" "I’m not looking for bad things to happen." She assured him. "I’m just a little enthusiastic, that’s all." 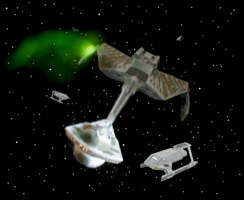 The Romulan Bird of Prey banked hard to starboard towards her final destination. The light of the stars glinted over her gleaming white paint and flashed over the sprawling emblem of a bird on her belly. The two nacelles jutted proudly from her flat pebble-like body with their reactor tips glowing a steady red. "Secure the warp engines." The Commander barked as his fingers flexed angrily at the arms of his chair. "Secure from Warp." His helmsman reported. "Reconfigure the nacelles for impulse drive and route power to defensive systems." He ordered, his voice dripped with efficient resolve yet his thoughts were elsewhere. "Engines are set into reconfiguration cycle." The crewman reported as the nacelle machinery adjusted from the ability to generate a warp field to become impulse drives. "We have power to defensive systems." "Engage cloaking device." The Commander barked over the droning systems reports coming around the control room. The lights around the bridge lowered automatically and the glass dome at the heart of the bridge began glowing red as a warning to the crew that the cloaking generator was finally active. "Nice to be here.." His first officer offered to the Commander as he lingered closer to the centre of the bridge. "Meaning?" The Commander asked angrily without troubling himself to turn to face him. "This could soon be a thing of the past!" Officer K’vel replied. "Separating the warp and impulse engines will mean we could operate the cloak while at warp, no more reconfiguring the engines." "It would give us a genuine tactical advantage." He grumbled a grudging agreement. "But the power systems are highly experimental on the prototype, I doubt the ship will work as well as the projections claim!" "But that’s what we’re here to find out!" The first officer continued his cheerful dialogue. "We’re honoured to be part of the trials." "An honour?" He grumbled. "My forward bays are full of observational equipment and scientists who question my every move while we watch a trial that could replace my own ship!" "History!" He told him. "And we’re a part of it." "Sir!" Ensign Peterson called out suddenly. "I’m detecting a strange power reading in the cargo bay! "Cargo bay?" The Commander spun around in his moulded plastic chair from the flight controls. "This is a courier ship, for the duration of this mission our cargo bay is where we’re meant to eat our dinner!" "Sir!" She continued unabated. "I think this is serious!" "There’s nothing down there." He frowned as he remembered the few meagre items they’d taken aboard as formal gifts for the dignitaries they’d be meeting on their arrival. "It’s very, very slight." She explained. "But a power signature is growing in our lower bay!" "What kind?" He stood up from the chair he’d been in for three straight hours, his back was sore and tight from being in the same position for so long and he rubbed the small of his back and stretched. "I’ve not seen anything like this…" She shrugged. "I should go down there." "I’ll go!" He replied wearily. "But sir…" She cut herself off as she spoke, her hand reflexively removing the sound clip from her ear. "You can come with me!" He smiled at her knowingly. "If there’s an adventure to be had then I’d hate to deny it to you." "Come on…" He stepped towards the door, gesturing for her to follow. "Bring the stuff." "Yes sir!" She replied excitedly, grabbing a phaser pistol from the equipment locker. "I meant a Tricorder." He told her sternly, glowering at her from the door with crossed arms as his toe tapped on the floor. "Sorry…" She pulled an odd expression as she powered down the weapon and safety locked it before returning it to the storage compartment beside her console. The bay was relatively large as the two crewmen stepped out of the small corridor and gingerly walked in. Commander Graves rubbed his head and glanced about, resigned to the idea that his crewman was wrong but bored enough to welcome any distraction. "Over there…" She pointed to a small row of boxes containing Federation souvenirs to offer to the colonists. 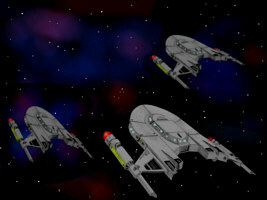 Her tricorder began bleeping wildly as she waved the large black unit around the bay. "The signal is coming from the third box!" He glowered at the box, a standard Federation packing crate in expanded polymer foam and a warning sheet on the front in black that told him that it contained a benign load. "That one?" He pointed at the box, finally experiencing a mild sense of trepidation. "Yes, Sir!" She agreed, flipping down the lid on her Tricorder and turning to face him with a wry grin. "Ok." He muttered to himself as he stepped forwards to the box. He knelt down and gently rested his hand on the top of the crate. He ran his fingers over the lid and gritted his teeth slightly as he glanced back over his shoulder. "Would you like me to open it, Sir?" She asked, rocking back and forth on her feet. "I’m just concerned about breaking protocol by looking inside." He raised his eyebrow, hoping that his explanation would sound convincing. "It would be if there wasn’t a genuine risk to the ship!" She told him. "Guidelines clearly state that it’s our duty to investigate!" "Ok." He grumbled, his hand hunting for the manual release switch. His finger found the locking mechanism and snapped it open. The display on the top switched from green to red and he took a deep breath. In the periphery of his vision he noticed the Ensign edging away from the box and that did nothing to boost his confidence. The lid hissed as his fingernails dug into the seal. He found the ledge and pulled the lid up as quickly as he could, his eyes closed and his breathing was laboured as he felt a rush of stale air from the inside. He yelled in surprise and stumbled backwards, falling uneasily from his feet. "Are you ok?" She cried out as she rushed forwards. "Fine…" He grumbled in embarrassment as he clambered back to his feet. "Just a little surprised is all." "What is that smell?" She wrinkled her nose in disgust and grabbed her tricorder up and snapped open the lid. "I don’t know." He admitted, standing up and brushing himself down, relieved that she seemed distracted from his embarrassment. "What’s in there?" "Not much…" She replied in surprise. "Just some dust, it’s mostly silicon." "That’s what it appears to be." She told him with a shrug. "Why do we have a box of sand on board?" "It beats me!" He admitted, losing all interest in the entire bay and wishing he’d ignored her all along. "Just seal it back up!" Suddenly her Tricorder began bleeping wildly. "Sir!" She cried out. "What?" He asked in surprise, beginning to feel genuinely, deeply nervous. "We’ve dropped out of warp!" She told him, her fingers dancing over the controls. "The internal computer has detected a hazard and has already begun transmitting a distress call!" "Everything on this ship is heavily automated." He explained as he began heading for the bridge. "There aren’t many ships out this far!" Ensign Peterson called out from behind him. "The first thing to do is to use the internal scanners to find out what the hell is going on." He told her as he paced quickly along the narrow corridor. "Yes Sir!" She agreed, dropping the Tricorder to hang limply at her side on its black vinyl strap. "I hope this is enough of an adventure for you!" The courier ship listed helplessly in space as all power had been withdrawn from her drive systems. The boxy ships thrusters were inert and only her inertia carried her lazily forwards along the Federation border. "I don’t know." Commander Graves groaned from his console. "The ship seems to have detected an internal hazard. "Sir!" Ensign Peterson leant back nervously from her computer terminal. "Maybe it was the box!" He said to himself, trying to use the internal sensors to analyse the contents. "Sir…" She said again with more urgency. "Can you download your short-range Tricorder scans to the main computer?" He turned to face her. Her rounder face was ashen with fear as she stared back at him. "What?" He asked, his eyes widening and his heart suddenly pounding. "A ship." She told him, wiping her long black hair from her eyes. "Coming this way?" He asked. "A ship?" "I think so." She nodded awkwardly, wringing her hands together. "Tell me." He ordered, his voice as steady as could make it although his nervousness was growing. "It has a cloaking device of some kind." She explained. "I detected it but then it disappeared." "Are you sure you’re using the equipment correctly?" He sighed slightly with some relief. "It was a D7." She was shaking visibly. "It was heading this way." "A Klingon?" He leapt up from the chair, beads of sweat pouring down his forehead as he turned to his own console. "They’re heading this way…" She told him. 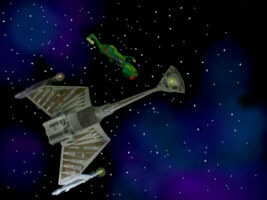 The old Romulan Bird of Prey perched anxiously at the perimeter of the test zone as three small scouts flew past her. They were uncloaked, white vessels with their markings removed and their systems automated to function in a limited capacity without a crew. "They still have shields?" Commander R’man leant forward in his chair, his chin supported thoughtfully in his upturned palm. "I believe so." The first officer agreed as he reviewed the files gleefully. "It wouldn’t be much of a test otherwise." "It won’t be much of a test anyway." He argued. "A real ship of war will tangle with armed adversaries, inventive crews who will fight back." "I believe the testing phase is pretty much over." The officer smiled and raised his eyebrow knowingly. "This is a demonstration, this is a show of power." "A show of power?" He scoffed at the very suggestion. "This is a demonstration of the new ship for those in power." The first officer grinned. "She will be able to travel at warp while cloaked, will have two focused plasma weapons and even be able to land." "If it works." The Commander grumbled half-heartedly. "If it works then the Romulan Empire will have entered a new phase." He enthused, stepping towards the viewer to get a closer look at the target area. "We’ll have a weapon that will be a genuine threat to the Federation’s Starfleet and a ship that will rival the Klingons K’remmer class ships." "We’ll see." He sat back, far from convinced as the three small scouts vanished into the target zone. The K’t’inga class cruiser swam into view, still at a distance but looming large in the viewing transparencies. It was an aggressive vessel, a dull green sheen to its armour and a massive weapons head with huge disrupter pads pointing at the small courier ship. The torpedo launcher lit up suddenly a dull yellow and gradually glowed hotter as power was fed to the magnetic firing coils. "Shields?" Ensign Peterson suggested hopefully. "What shields?" The Commander grumbled, his eyes fixed fearfully on the hostile alien craft. "The ship’s power systems are off-line and even if they weren’t we’d hardly be much of a match for that…"
"Maybe we could get power back online." She suggested, turning to her controls in the hope of overcoming the emergency lockout. "We’re no match for them!" He spun around and shouted at her firmly. "That is a ship full of trained killers. They’re warriors, nothing more." "No buts this time!" He told her angrily. "Klingons don’t have schools, they don’t have hospitals, they don’t have scientists or ambassadors. They’re warriors, they are taught to fight and kill from the cradle until they meet an accident or a better warrior. This ship has two phasers and a level 2 shield generator and you want us to face down a ship that outguns us by over a hundred times… It’s time to grow up." "They’re hailing…" She told him sheepishly. "On speakers…" He instructed grimly. "Small Federation ship…" A voice boomed out over the ships systems. "You will surrender your vessel immediately to the Klingon Empire!" "You are in Federation space." Commander Graves began, clinging to any shred of hope he could summon up. "Your presence here constitutes an act of war!" "Surrender your vessel!" The anonymous voice repeated with a note that suggested a hint of withering patience. "We have no interest in you. We will search your vessel and you will remain our prisoners until we’re finished with our mission." "Can we trust them?" She asked with obvious trepidation. "I don’t see that we have a lot of choice." He replied, chewing his lip thoughtfully. He reached forwards and opened the channel to the Klingon battle cruiser. "You are free to beam aboard." Almost instantly three figures appeared in a shimmering yellow haze, accompanied by a low humming noise. Gradually their forms sharpened up and they stepped forwards with Bat’leths at their backs and disrupter pistols in their gloved hands. Their faces were set in angry snarls that looked just a trifle too rehearsed and their leather and metal armour chinked softly as they approached. "We’re unarmed." The Commander told them, raising his hands in the air and casting a glance at his junior officer to silently tell her to follow his lead. She did so hesitantly. "Female." One of the Klingons grunted in a kind of aggressive growl. "Well done." She replied sarcastically, looking up to the massive frame of the warrior. "And you are?" "He didn’t have enough intelligence to grasp her insult but knew that one had passed to him. The Klingon behind him knew so too and laughed heartily, slapping his comrade on the back. "You have fire!" He told her with a booming voice, his massive weapon flailing around the control deck as his chest rocked in amusement. "I like you… perhaps I will take you as a mate." "I doubt you’re man enough for me." She told him bravely, remaining composed so well it surprised even her. "I don’t tend to go for the sensitive type." "There are no old warriors." He told her, finding her suddenly less amusing. "And yet somehow I doubt that you will live as long as I." The third Klingon was already tearing his way through the weapons racks and discarding the old style phasers on the floor as he scrambled around looking for something more exotic. "Your power failed?" The most verbal of the three asked, aiming his question at the young Ensign. "The computer detected a hazard that it couldn’t identify." She explained, glancing briefly over to the Commander. "It’s Starfleet protocol for small vessels of this type to power down if that happens. We were locked out of the systems until the computer was satisfied that it was safe to continue." "It has not been your lucky day!" The gigantic man stooped down to peer into her eyes on her level. He grinned showing rows of slightly blunted yellowing teeth that showed rings where they’d clearly been sharpened by a machine. His breath was foul and stale and his eyes were dark with a look that showed he placed little valued life on life, even his own. "We’ve had better." She shrugged. The Klingon smiled widely and stood back up. "I am Krogal." He announced. "First officer aboard the Gra’N’nork. You are now my prisoners." "I should warn you that our ship has already transmitted a universal distress call and Starfleet will send a ship for us." Commander Graves told him, somewhat intimidated by the three burly Klingons. "So?" Krogal shrugged his heavy shoulders, seemingly mystified at what threat that could possibly pose. "They’ll send a Starship." He explained hopefully. "They won’t stop looking for us." "We’ve already jammed your signal." Krogal shook his head and smirked at Graves inept attempt to negotiate. "They will come, but by then it will be too late!" "Too late for what?" Ensign Peterson asked. "What are you planning to do to us?" "To you?" Krogal turned his attention back to better sport. "Why do you Federation types always assume that the universe revolves around you? We have no interest in you." "Then why take us captive?" Commander Graves shrugged, being very careful to keep his hands from moving in a way that might suggest he had a weapon secreted about his person. "You are not our captive…" Krogal said with a grin, his attention still focused on the junior officer. "We have rescued you." "We thank you." Graves said. "But if you simply leave us be then we can easily repair our ship and be on our way." "Your ship is a hazardous place." Krogal turned finally to him and spoke firmly, knowing already that it would silence the man. "We intend to obliterate it to stop any further contamination." "And where will we be?" Ensign Peterson asked, slightly nervous at last. "In my brig!" He told her. "Ah." She replied with sarcastic relief. "The guest quarters! What time will you be serving dinner?" Commander Graves and Ensign Peterson languished in a tiny metal cube made from roughly welded plating and a wire grill over the door. The only additional security measure was a heavily armed Klingon warrior at the entrance to the brig and that was more than adequate to ensure that attempts to escape would be a rare and futile occurrence. Tactically it might have been better to separate them but the Klingons saw them as offering very little threat and had chosen to lock them in together. The cell had no technology, no electronic locks, no panels with wiring. Just a steel bar locked from outside secured them in and with them being thoroughly searched and having their personal items removed their chances of escape were very slight. "Do you think they destroyed our ship?" She asked, hoping to break the silence. "I can’t see any reason why they wouldn’t." He leant back on the cold steel wall. "From what I know of these people they do what they say they’re going to do." "What do you think they’ll do with us?" She swallowed hard, hanging her head under the weight of her fears. "I don’t know, Ensign." He told her. "If they’d wanted to kill us they’d have left us on board." "Maybe they want to question us?" She suggested, shuddering at the thought of what that might entail. "And the name is Gena." "Gena?" He repeated, his mind distracted. "My name." She smiled weakly. "It’s Gena." "Peter." He replied, seeing beyond her uniform for the first time. She was young, only about 19 years old with shoulder length dark hair and dark eyes that reflected her inner desire to test herself. "Peter." She began, finding small comfort in a more Human name to have to call him by. "Why are they in our space? They had a kind of cloaking field up, they’re up to something." "I wish I knew." He shrugged. "They’re not heading any deeper into our space, just skirting the edges of Federation territory." "Perhaps they’re going to attack a colony?" She snapped up, fearing suddenly for the Baggons. "They’re back the other way." He shook his head. "Then where are they heading?" She asked. "If I had to guess…" He began. "…I’d say we were heading towards Romulan space!" Commander R’man sat in the command chair aboard his ship. His Bird of Prey was a tired machine but had distinguished herself in battle on several occasions, as had he. He read through the reviews of the new prototype, the vessel he was there to observe with a bay full of the designers and military officials who would doubtlessly be highly impressed with the childish display of needless muscle flexing. There was no doubt that the new ship was an improvement. His ship had two nacelles that operated either at warp or impulse and left him vulnerable for nearly 30 seconds when he secured his ship from warp while the engines reconfigured and fed the first taste of power to the cloaking device. Ironically the new vessel could go to warp while her cloaking shields were up but the display was a simple test of her picking off three automated drones, a task his own ship could easily excel at with her powerful plasma cannon in the nose. He knew from bitter experience that the officials would be highly impressed at the display in their ignorance of actual military techniques. "They’re ready to begin." His first officer said, cutting into his train of thought. "We’re in position and just need your confirmation." The three scout vessels were in their relative positions around the target site, converted to target drones with sophisticated automation equipment. At his instruction the trial began and all three ships initialised. Their defensive energy shields flicked on and their weapons primed as their sensors began scanning for the attacking ship. The first banked to starboard lazily to make a sweep of the area with her scanners. Suddenly the space behind her rippled gently and a ship began to appear from the blackness of space as if the shadows were pulled back like a curtain. The ship was wide, shaped like a bird with elegant sweeping wings with throbbing nacelles on the tips. 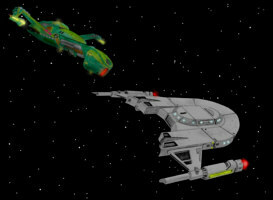 Her hull was finished in green in a return to the traditional Romulan colours and the bird insignia was gone, replaced with the entire ship design emulating the totem of her species. The scout vessel detected her too late, flaming green plasma bolts shot out from her guns and caught the shields of the stricken vessel. The scout tried to return fire but couldn’t bring her weapons to bear before a volley of fire collapsed her defences and began carving up her hull. The ship erupted in flames and exploded in a shattering blast of debris as the prototype vessel vanished again in a hazy blur of colour. "Impressive!" The first officer smiled widely. "A beautiful ship!" "Could this ship not do that?" The Commander asked rhetorically. "Not so well." K’vel played devil’s advocate. "Her guns are primed for firing the instant the cloak falls and she can jump to warp as the cloak begins to shroud her in shadows." "An improvement." He agreed. "But with a competent Commander a contemporary ship could easily overcome any minor disadvantage." "The New Bird of Prey is a superior vessel in every way." K’vel told him with a knowing smile. "If you weren’t so close to retirement you would doubtlessly be commanding one yourself in a few years." "This is a proven vessel." He glared up at him. "I think that they intend for this to be an honour for you." He said thoughtfully. "Commanding one of the most successful Birds ever and then at the end of your career ushering in a new era of technology." "My career is not over yet!" He scowled. The second scout ship faired little better than the former. The Bird of Prey appeared directly in front of her and spiralled in, avoiding the pulsing weapons that flailed wildly towards her. The returning fire obliterated the scout and the ship blasted through the debris cloud with her shields defending her from damage. The third and final ship was vanquished even more quickly as the Bird of Prey vanished into darkness and appeared behind her sending a tirade of weapons fire into her stern. "How are my guests?" Krogal boomed at the two captives. Peter Graves stood up and straightened his yellow tunic. "We’re fine." He replied. "Where are you taking us?" "To be honest." Krogal grinned maniacally as he spoke. "I have lost all interest in you." "What do you mean?" The Commander asked, his stomach knotting at the last comment as concerns for their lives resurfaced. "We have a special mission." Krogal told him proudly. "We are what is known throughout the Klingon Empire as a Vulture ship." "What is that?" Ensign Peterson hoisted herself numbly from the plated floor to join the conversation. "We are assigned with the duty to scavenge technology from other races, we capture new weapons and sources of power." He told her with a troubling glint in his eye as he glowered at the young Ensign. "Am I meant to be impressed?" She huffed, folding her arms over her chest and looking away. Commander Graves shot her a caustic glare, hoping she wouldn’t antagonise them further. "We found nothing on your ship of value so we destroyed it." Krogal told her. "What happens to you is up to me!" "What do you plan to do?" Commander Graves asked, stepping in front of her before she could speak. "We have a mission, your ship was just something we encountered on the way and we dealt with you before you could report our presence. On our return we will hand you over to your people as your saviours." He told him. "We’re after something bigger." "Something Romulan?" She asked, ignoring her better judgement. "How did you know?" He scowled, stepping back from the grilled doorway in surprise. "You were heading towards their space!" The Commander told him quickly, hoping to diffuse the situation." "Yes!" He smiled, his sickly sharpened teeth glinting as he did so. "Something Romulan. Soon everyone will know of our deeds this day." "You’re going to steal a ship?" She asked, pushing her way past her commanding officer. "Capturing a ship!" He corrected. "And our actions will bring us a glorious battle, we will take their ship and the floors will run thickly with their blood." "Great." She smirked back. "You can drop us off here then." "You are free to go, little girl." He told her, gesturing to her. "As soon as the Romulan ship is ours! We want no trouble with your Federation!" "How could I forget?" She grinned sarcastically. "You are our guests." He sneered back. "You are but a Human child and yet I sense the burning heart in you of a warrior!" "I had a spicy lunch." She told him, her eyes glinting with hostility. "I like you." He told her with a vile snarl that was meant to purvey a warmth somehow. "If you wish I could arrange for you to observe our triumph from more comfortable quarters." "In return for?" Commander Graves asked. "The offer was not extended to you." "A total triumph!" Officer K’vel shook his head in wonder as the Treldek flew towards the burning debris field that was all that remained of the last two scout drones. "Incredible." The viewscreen stared fixedly out into space as the image of the new Bird of Prey ship floated gently out of the darkness into view, her nacelles jutting out on her elegant movable wings. The nose burnt with an incandescent red from the firing tubes as the ship hung almost motionless in space as her thrusters fired to settle her into position. "It is an impressive design." Commander R’man admitted grudgingly. "The engineering allows for a powerful defensive and weapons platform." "That is the future!" K’vel cried out, pointing wildly to the ship. "With a fleet of craft such as those the Romulan empire can re-ignite the war with the Federation and take the attack into their very heart, cutting them up before they even know we’re coming." "They are no match for a Federation heavy cruiser." The Commander told him flatly, his voice remaining calm as his officer discarded any modicum of self control. "It’s the technology…" He almost pleaded. "Can you not see that? This ship represents a turning point in our powers of making war. No longer will we have to warp to our position and then sit and wait while our engines convert to impulse drives and then cloak ourselves. Now we can warp to our target and let death rain down on them with our new plasma cannons and torpedos. One day we will build gigantic Warbirds that will show our new powers to the Starfleet and the Klingons! The Romulan empire will be the decisive force in the galaxy!" "Is that what you think that is?" The Commander asked gravely, gesturing towards the ship floating out in space. "I do." He replied with a triumphant nod. "I once fought a Starfleet ship. It was a heavy cruiser." The Commander began. "I warped my ship into position and then set the engines and raised the cloaks. I waited for 4 days until I made contact with my target, we had to crawl along at simple impulse, to warp in any closer would have been to risk detection. When the ship arrived we attacked quickly, on our first pass we damaged the port nacelle and they were forced to eject it. After that they didn’t have the power to continue a sustained battle and we easily beat them down, uncloaking in different positions and taking pot-shots at them with our plasma cannon." "Classic Romulan tactics." The officer grinned. "The ship was transporting Romulan prisoners of war." He sighed wearily. "It only contained a skeleton crew of Starfleet officers, that was why we beat them down so quickly and easily." "Bad intelligence?" The officers smile vanished as he spoke. "No intelligence." The Commander scoffed. "They just detected a Federation ship and set us on it. They buried the reports as they were bad for morale." He said nothing, simply stared into his commanding officers eyes while his mind adjusted to the tale. "I’m sick of killing and death, I’m sick of war!" Commander R’man told him, raising a finger to the viewscreen. "That ship is death, it reeks of violence and murder and can only usher in a new era of insanity." "What would you have us do?" He mumbled in a low voice. "I would step back but the officials will not listen." He replied. "The battles are over, we need to step away from war for now and examine ourselves. We have been lucky in our conflict with the Humans and must now ask if the path we have trodden is the best one for our people." "We will not cower behind Human ideals!" K’vel said angrily, his passions stirring again. "I don’t ask that of our people." He replied calmly. "We were not ready for the war we fought and we are still not. We need to grow as a people, we need to take the time to adjust to the peace we are lucky to finally see." Krogal glowered menacingly across the officers lounge that protruded from the rear of the forward head at the front of the connecting boom that stretched out with an uneasy elegance. He glared as he stood in the narrow doorway, his eyes fixed on the young Ensign who sat in the only comfortable looking chair, perhaps on the whole ship. "You are now my guest!" He told her angrily. "I’m honoured." She sighed, crossing her arms and turning away in disinterest. "You certainly are!" He told her, stepping forwards. "I hope I can trust you not to force me to regret my hospitality." "What do you want from me?" She scowled. "Because not a lot is on offer!" "I want nothing." He told her firmly in a guttural growl that was actually a soothing tone for a Klingon. "You have nothing I cannot take should I change my mind." She shot him an acidic glance that would have been a potent weapon if looks somehow acquired the power to kill. She crossed her legs and thought for a moment. Her Commander was still locked up in a brig cell but at least now he had been fed. He had more or less instructed her to go along with whatever game Krogal wished to play. She may glean some information and at least her chances of survival would be improved, at least if his plan didn’t involve her death or some other activity that might make her wish that it did. "So what are we after?" She asked, offering him a little more of her attention for now at least. "Glory!" He told her. "As are all Klingon warriors!" "Are you warriors?" She asked sarcastically. "There’s not much honour in stealing a Romulan ship." "It is a great honour to be assigned to the Vulture squad." He banged his hand hard onto his chain-mail chest armour. "Many warriors would lay down their reputations for a chance just to take the entrance trials." "You honestly think you’re doing a good thing?" She smirked, her arms unfolding from her chest. "You don’t see anything wrong with violating Federation borders to sneak into Romulan space with a slightly defective cloaking device to steal a ship!" "Our cloaking device only keeps us hidden from your long range detectors, a ship can see through us!" Krogal replied with a frown. "That will no longer be a problem after today." "You’re after a cloak?" She cocked her head to one side in interest. "We’re after a brand new piece of technology with the most advanced cloak in the galaxy!" He announced proudly. "The Romulans are testing a new prototype today and in three hours we will take it away from them!" "How do you know?" She asked, leaning forwards reflexively in interest. "They want us to know!" He laughed. "In their arrogance they think that their new ship will shift the balance of power to them and they want us to fear them for it." "What is this ship?" She frowned. "What’s so special about it?" He turned from her suddenly and stepped briskly across the otherwise deserted lounge that he had secured for his own use, a privilege of his rank. He opened a corroded metal hatch and pulled out a wide rimmed bottle and two dull metal goblets. He grinned to himself as he made his way back over to the young officer. She watched him intently without a modicum of trust in her eyes. She focused on the bottle that held no clue as to the contents. "Blood wine!" He growled happily. "This is the drink of a true warrior, it is the mark of a pure heart. Somehow I think that you will like it." "Do I have a choice?" She grimaced as the thick liquid burbled from the bottle into the filthy cup. "You will drink with me!" He told her. "You only live once." She shrugged. "…Not always for very long…"
He shot the liquid back and wiped his mouth enthusiastically. She watched him as he gestured wildly for her to follow his lead. She gingerly sipped at the grim dark fluid. It lit up her taste-buds instantly with a jolt. It tasted of children’s cough-syrup, thick and sweet and swallowing couldn’t quite get it down her throat in a single try. "That’s disgusting!" She cried out in amusement. "You will learn to love it!" He told her with a grin. "So what about this ship?" She asked, offering her cup grudgingly for a refill. "It’s a new vessel. Built to replace their fleet of Birds of Prey." He told her as he savoured another goblet full of blood-wine. "She is rumoured to have full cloaking ability while travelling at warp. Once the cloaking field is dropped the wings can open the radiators almost instantly to allow her to fire." "Is that it?" She mocked his enthusiasm. "Can’t it do anything else? For this much trouble it should be able to fly through a sun or travel through time!" "It may be able…" He shrugged. "Much of what I know is only rumour." "So how do we fit into all of this?" She shrugged as the blood wine began to take hold of the stem of her spinal cord and spin her brain about the room. "We just saw you along the way." He told her. "We honestly have no interest in antagonising Starfleet at the moment." "At the moment?" She asked. "You Humans are not as puny and stupid as you look." He told her with a wistful glint in his eye. "Are you?" She smiled back, fluttering her eyelids innocently. Commander R’man stood in the main cargo hold of his ship, surrounded on one side by high ranking military officials and on the other by an arrogantly self-assured design team that were responsible for the new Bird of Prey. "The secret is in the wings!" Mar’Vok told the crowd. He was the head of the team and knew little of engineering but was an excellent project manager. "They are actually a gigantic defensive shield generator grid with the warp nacelles built into the tips. Moving them down opens up the radiators and brings the plasma injection feed lines to connect with the weapons systems, moving them to the centre feeds power directly to the nacelles for warp." "So it has two power generators?" An ageing soldier in the crowd clamped his hands together behind his back and stepped forwards. "Not really. It has large storage batteries so that the power is shunted to where it’s needed." The team leader told him. "Main power is always on tap for the cloaking device or the weapons and shield systems. "How does this compare to the old Bird of Prey?" Another voice asked. "I was hoping for that question." The leader held up a finger. "To answer it properly we have arranged a brief tour of the new ship." Muted mutterings sounded briefly around the bay. "I have arranged for the actual members of the design team to take around the military staff personally and demonstrate the ship in a way that only they can. We are cleared to beam aboard immediately." The new Bird of Prey vanished in a wavering haze of light that enveloped her as she manoeuvred away from the ship she was destined to replace. "The cloak is engaged!" The team leader said from the front of the bridge as his design staff operated the controls. "Watch now as the ship easily configures to cruise mode and goes to warp as fast as a Commander could order her to do so." The enthralled military officials stood in silent awe as the graphics around the bridge showed the wings moving to the horizontal plane as instantly the stars stretched to infinity and the ship was at warp. "She’s capable of Warp factor 6 at the moment." He told them. "The production models may be even faster!" "Sir!" A middle aged man called out. He was a designer who had arranged the bridge layout and the stress points to mount the wing mechanism but now he was staring at a control panel with a look of confusion. "Yes?" The leader asked, allowing him to continue. "I’m detecting a vessel up ahead on our course, it’s using a very primitive kind of cloak but is heading directly at us!" "Another demonstration?" A voice called out. The Team leader smiled awkwardly. The Klingon ship shed her cloak uneasily ahead of the Bird of Prey. The cloaking device was an ancient unit scavenged from an alien race that had never designed it for tactical usage. The massive K’t’inga swam into view, bearing down on the approaching Romulan vessel and fired a battery of photon torpedoes along her course. 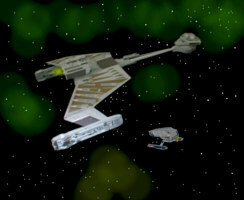 The Romulan ship instantly dropped out of warp and engaged her defensive shields in readiness for the impact. Captain Klaag sat at the command chair of his bridge. The Gran’N’Nork had been augmented with a great deal of captured technology over the course of her life and the bridge reflected that with mismatched computer terminals and parts added to improve and quicken her responses that had been added by inept Klingon warriors who generally thought that screwdrivers were a novel device for stabbing people with. Krogal ushered Gena Peterson onto the bridge with a gentle yet firm shove to her back that would have sent her flying had she not been partly expecting it. "They have dropped from warp!" Klaag announced proudly with a maniacal grin as he leapt from his chair. "Fire disrupters, minimum setting, target their bridge." 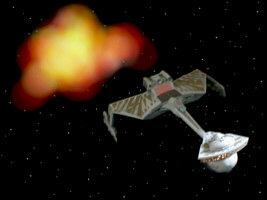 The main viewer lit up as energy beams lashed into the unprepared Romulan ship. The small craft rocked to the side as the beams tore into her shields sending green energy arcs pouring over her armour. "They are not even trying to put up a fight!" Krogal spat out the words in disgust. "A waste of a ship of battle to be crewed by Romulans." "Perhaps they know what they’re up against." Klaag hissed angrily. He spun around to his first officer and glowered menacingly at his guest. "Explain!" He said simply, his eyes settling on the young girl. "She has a heart that stands bigger than her stature." Krogal replied defensively. "It will serve her well to watch the actions of true warriors!" "Get her off my bridge." He growled as he began to clench his fists towards the small dagger he carried at his belt. "I believe her Starfleet experience may prove useful." Krogal told him with equal anger. "We will have to take the Romulan ship and quickly get what we need, she can quicken our task." The Captain scowled at her without another word. His eyes bored hatefully into hers but she stood her ground and peered up at him calmly. "You will co-operate?" He asked finally. "I’m no friend of the Romulans!" She replied with the ghost of a smile. "Krogal!" Klaag suddenly forgot all about her and returned his attention to the mission. "Assemble a boarding party and take that ship. Take the girl with you, secure the vessel and follow us out of here." They materialised on the prototype ship the instant that her shields fell to their attack. The Klingons saved their bloodlust for the boarding party for which there were no shortage of volunteers. The ship’s weapons were set carefully to avoid damage to their prize but the raiding team were whipped up into a frenzy by the time they arrived. The first four soldiers who were beamed aboard carried disrupter pistols and began blasting their way through the officials and scientists, cutting a swathe through the frightened and unprepared group. The next wave carried their Bat’leth swords and their eyes scanned for anything that moved and when anything did it was hacked unceremoniously to pieces. Krogal arrived last with the Starfleet Ensign. He watched with a sense of satisfaction as his team rampaged their way through the alien ship, hacking at the Romulans aboard with scant regard for what they were doing. Gena watched in horror, the threats she knew she was facing from the Klingons had seemed distant and unreal but now aboard the Romulan ship they were sharpened and brutally apparent. She watched as the warriors cried out in pleasure as they destroyed the crew in the narrow confines of the small ship. Krogal grinned more widely as the first of his men discarded their pistols and took to edged weapons to cut through the helpless Romulans. "This is war!" Krogal gestured to his men. "This is murder!" She said solemnly. "The Romulans aren’t even fighting back." "The Romulans are a warlike people without the stomach for battle." He argued. "This is the consequence of their actions." "I see no honour here." She turned and glowered up to him. "The highest honour is in victory." Krogal sneered back. "And this victory takes a weapon from the hands of our enemy and gives us a bigger sword to wield against them." The Bird of Prey had taken some damage to her weapons systems and her shields were off-line. Without a competent team of engineers aboard the damage was unlikely to be effectively repaired until the captured vessel could be taken back to Kronos. Krogal left a team aboard to command the ship with instructions to follow the Gran’N’Nork into warp and engage the cloaking device. The two vessels quickly plotted a course out of Romulan space. Ensign Peterson slunk into the brig to speak with her Commander. She was accompanied by a burly Klingon warrior who unlocked the cell door and then quietly returned to his station, leaving the two alone. She entered the cell and sat down heavily on the bench, the one stick of furniture in there. "They don’t see us as a threat." She told him wearily. "Are they going to let us go?" He asked hopefully as he tried to weigh her mood. "I think so." She nodded, turning towards him with an expression of weak acquiescence. "They captured a new Romulan ship, they’re not interested in us." "That’s good." He shrugged with some relief although her temperament showed that the day had exerted a heavy toll. "They killed the crew." She told him softly, lowering her voice as if in respect for the dead. "I was taken with them." "Did you participate?" He asked, his eyes widening expectantly. "No!" She shook her head firmly. "Krogal took me over to help with repairs, that was all." "Are you ok?" Commander Graves inched towards her and put his hand on her shoulder. "I knew they would." She said softly, choking back tears. "I knew they’d kill them. I watched helplessly from the bridge while they slaughtered the Romulans." "Go on." He told her as she began to slouch further down, her head hanging forward and her eyes reddening as her battle to hold back the tears started to fail. "I just stood there as they cut them up with their swords." She began to sob, tears ran down her face as the vivid memory danced in her mind of the atrocities she’d witnessed. "All I could think was that it could be me. I just wanted to stay out of the way in case they turned back against me!" "That’s natural!" He told her, he took his hand from her shoulder and wrapped his arm around her. "Klingons do things like this, it’s not your fault." "I couldn’t stop them!" She sniffed, wiping her eyes with her hand. "Nobody could!" He assured her. "I’m just glad you’re alright." She gave in to her pain and cuddled up to him and began crying openly. He squirmed slightly in embarrassment but kept telling her that things would be alright. Commander R’man closed his eyes in grim resignation as the distress report came over his comm system. "Attacked?" Officer K’vel cried out. "They’ve stolen the ship! How can this be?" "It was very short sighted of the war council not to anticipate this." The Commander said coldly. "We must go after them. We must bring them back!" The first officer panicked. "Go where?" The Commander asked sarcastically. "The ship is cloaked and immune to all sensors, where would you have me go?" "We must try!" He insisted. "In war," the seasoned Commander began, "all weapons are double edged. A sword can easily be turned against those who wield them. That is a fact that must be accepted before you begin." "We can’t just hand over the most dangerous ship ever made to an unknown force." He waved his arms about in frustration as he edged to the sensor controls, knowing already that any equipment on the ship would be useless. "It wasn’t just the ship." The Commander reminded him. "We have lost the design team, we’ve lost the military officials that funded the project in the first place. We have lost the Bird of Prey project entirely in one arrogant moment." "I won’t believe this!" The young officer continued. "Where is the future of warfare now?" The Commander smiled for the first time in a long time. "Thanks to your mentality we’re now in a corner that I would liked to have seen come about through good sense. Now the Romulan people have no choice but to stand back and reconsider their place in the universe." "We will make them pay." He said with determination. "Your future vision of glory is one of gigantic battleships and fear at the sound of our name on the lips of alien races." The Commander told him. "My vision is somewhat different. The humans were wise to align themselves with our distant cousins and form the Federation. Perhaps our future follows a similar path." "We shall see." He sneered. "The ship is secure?" Captain Klaag asked, his immense frame was settled uneasily in his command chair while his warriors scuttled around dutifully operating the ships controls. "It is a little faster then we are!" Krogal reported. "My men are patching up the damage now. The weapons are not particularly impressive, the power grid is heavily compromised to supply power to the various systems. It is a tactical vessel, not a battleship!" "But still a worthy prize." Klaag grinned, his lips pulled back over his sharpened teeth. "It will bring much honour on our names when we arrive with her." Krogal grinned back proudly. "I have informed the council of our success." Klaag told him. "They await our triumphant return." "I did not expect to capture the entire ship." Krogal noted happily. "I would have been more than satisfied with the schematics, it serves us well that fortune has smiled on us." "We are Klingons!" Klaag pointed out redundantly. "The Romulans lost their nerve at the first sight of our ship. They declare war on everyone and then scuttle away when the firing begins." "Sir…" The helmsman spun around from his console. "I am detecting something up ahead." "Report!" Klaag sprung up from his chair with a speed that belied his large size. "Some kind of probe, a listening post of some kind. It wasn’t here before." "We’re in Federation space." Krogal warned. "We cannot risk detection." "Can we manoeuvre around it?" The Captain growled in annoyance. "Yes sir." The officer reported. "Then drop out of warp and make the corrections." He grumbled. "We have to get off this ship!" Commander Graves paced the small cell thoughtfully. "I still have free reign." Ensign Peterson told him. "Can you get to the shuttle bay?" He turned suddenly with the glimmer of a plan. "I think so." She nodded hopefully. "But they don’t have any shuttles. They have fighters, small heavily armed attack craft with the same cloaking device that the ship uses." "That could work!" He replied with a weak smile. "Do they have transporters on the fighters?" "No." She shook her head. "I don’t think so, but they do have a computer link with the ship, I might be able to access control from the fighter." "If you could launch a fighter you might be able to beam me over." The Commander suggested. "The cloak won’t give us much protection but if we take the ship into the gravity field of a moon or something then they might not be able to find us." "It’s worth a try." She nodded. "I think I can hold up my end but I don’t know where we are, we’ll have to move fast once we’re away." "We’ll be highly motivated!" He smiled. "Does Krogal trust you?" "Yes." She nodded firmly. "I actually quite like him, he’s quite intelligent underneath all the growling and posturing." "Go on then!" He told her. "As soon as you’re clear beam me off." "I’ll need something to lock the targeting scanner onto." She shrugged. "They took our communicators." "I have this…" He reached down the neck of his tunic and pulled out a gold pendant on a thick chain. "It’s pretty old. It should have a number of impurities, not the kind of gold you’d use in a sensor array, you should be able to find it." "I hope so!" She smiled back. 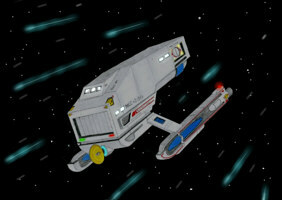 Ensign Peterson was glared at as she made her way along the spartan metal corridors of the Klingon ship. The design was ancient and had taken form from necessity alone. Load bearing structures and weapons points marred the internal layout with engineering running openly through the roof and at the sides of the bulkhead. Her reputation prevented a warrior from attacking her, Krogal was a powerful man in every sense of the word and to cross him would mean a dishonourable death as it was known that she was his guest. She wandered towards the rear of the ship as she struggled to recall her brief orientation course on Klingon ship design from her recent academy days. She remembered that the shuttle bay nestled between the heat exchanges on the top of the hull and as close to the rear as you could get on a D7 class ship. To reach the bays she had to keep heading away from the bridge. Her Universal Translator was still functioning but she couldn’t read Klingon and asking for directions seemed like a poor idea to say the least. As she trudged on she found a schematic of the ship. She ran her finger over the glowing orange outline of the vessel and smiled that at least she was heading in the right direction. As she continued she wondered if her guest status would allow her to step aboard a fighter and somehow she doubted it would. "Secure from warp." The helm officer reported. "Set new course to avoid the scanning probe." Captain Klaag grunted at his men. "Sir, something’s coming in…" The tactical officer warned. "Some kind of energy pulse." "Shields!" Krogal ordered without hesitation. "Too late!" The tactical officer cried out. The ships rocked to the side and the bridge erupted in anarchy as systems overloaded and conduits blew out. A tiny black plastic disk floated in space. Inside the casing was an advanced sensor grid and an ion-cannon with enough power for a single shot. It was joined by dozens of similar units which had been strategically positioned at every point where a ship would have to drop out of warp to make a course correction because of the probe. Another disk lit up with a blue flash as energy lashed out at the Klingon ship, temporarily damaging her electronics but sparing the hull. "Shields not responding." Krogal shouted above the warning klaxons. "System damage all over the ship, Helm not responding." The Captain glared at the flickering view as the tactical overlay vanished to be replaced with a warning of an approaching ship. "Status?" He called out, his voice booming with authority. "What’s out there?" "One large ship!" Someone replied. "Three smaller shuttles." "Type?" He asked as he flicked open the arm of his chair and drew out a large disrupter pistol. "I can’t be precise." The tactical officer barked over the sirens. "But they’re Federation vessels of some kind!" "Break out the weapons!" The Captain instructed. "Prepare to fight hand to hand." He turned angrily to his first officer. "Find your guest and bring me her head or I shall have yours!" Three shuttlecraft swept over the motionless hull of the ship. They were boxy and armoured with long nacelles and a weapons pod mounted at their rear that flaunted a massive phaser cannon each. The three small vessels moved to a tactical position, one at the bridge, one holding at the impulse engines and one at the port nacelle, each primed to fire a volley of energy which would be devastating to a ship without the protection of her shields. In the distance another vessel headed towards them. A small scout class ship, a strange design with a circular bridge suspended between two stumpy nacelles and a boom supported between two long outriggers that appeared too small for a turbo-lift shaft. The USS Oberth headed gingerly forwards towards the Gran’N’Nork, mindful of her inferior armament. Ensign Peterson pressed herself against the wall as a group of warriors ran past the end of the corridor. Her heart fluttered fearfully as they came a little too close for comfort and she could almost sense the same lust for violence that she’d seen aboard the Romulan ship. Sirens barked angrily all over the ship and she was forced to wonder what was wrong but so long as it cleared a path to the shuttle bay she would merely count her blessings for now. She checked each way and heard nothing, no clanking footsteps and growling barbarians so she pressed the hatch controls and the bay access doors slid open with a loud sigh. She took a deep breath and stole her way inside, hoping against reason that the bay would be deserted. She glanced around the shabby and unkempt hangar with relief that she appeared to be alone, for now at least. Two of the craft were hanging from support scaffolding, suspended from the ceiling. She quickly scurried aboard the closest one and sealed the hatch. Krogal pushed past the guard and entered the Brig. He strode noisily down to the last cell and stepped inside as Commander Graves stood up with notable alarm. "We are under attack." Krogal sneered. "Romulans?" He suggested, swallowing nervously as the large man stepped closer. "Federation!" He corrected. "You have caused this!" "Me?" He cried out in surprise. "We treated you well and you have betrayed us!" Krogal glared into his eyes but the look held little genuine hatred, he was just testing the ground. "No." He whimpered. "We were just couriers." "I believe you!" Krogal grunted, turning away. "But we are under attack and I brought you aboard. I am expected to kill you both!" "You don’t have to." He stammered. "I don’t want to kill Ensign Peterson." He shrugged. "I like her. You I can take or leave." "What good will it do now to kill us?" He pleaded. "They’re just here to rescue us. If you hand us over and tell them you were trying to help us then there is no need for any bloodshed." "Do you honestly think my Captain will settle for that?" He sneered. Krogal reached out and grabbed the Commander by the tunic and pulled him close. "They want your blood." "No!" He shouted, pulling himself back from the warrior, his yellow tunic tearing away in the powerful mans hand. Krogal looked down in surprise to where a shred of his tattered uniform lay in his palm. He was slightly impressed at the meagre show of force, Humans always resorted to violence in the end and almost never went to their deaths without a fight. He caught sight of something metallic glinting in the uniform. He glanced down to where it sat in his open palm and then he felt a numbness through his body that caught him off guard. He looked up suddenly and noticed that everything was fading out in a flickering yellow haze and he realised that someone was transporting him. Klaag glared around helplessly. His bridge warnings had been silenced and the Klingons were waiting for an attack, a boarding party to transport aboard or the viscious little ships to begin firing at the disabled vessel. Suddenly a small cylinder appeared in a flickering transporter beam. They all backed reflexively away, fearing the worst. Suddenly the cylinder exploded with a soft crack and the top landed with a clatter as clouds of anaesthetic gas poured out from the opening. Klaag slumped to his knees with a sigh, cursing the name of the Federation that had robbed him first of his dignity, then of his prize and now finally of his death. "What?" Krogal sneered as he found himself aboard the fighters narrow control room. "Oh no!" Gena closed her eyes fearfully as she saw the mistake, the gigantic man clenching his fist around the gold necklace. "So it was you?" He growled. She pointed a Klingon weapon at him that stopped him in his tracks. He glowered at the discharge vent that jutted out at him. "We just want to escape!" She told him. "That’s all, would you do anything different?" "Perhaps not." He agreed with muted anger. "What’s going on out there?" She asked, poking the weapon forwards to accentuate her advantage. "The Federation is attacking us." He told her sarcastically as if certain she already knew. "They wouldn’t." She sneered. "They’d try to talk first, you must have fired at them." "We were tricked out of warp and attacked." He told her. "We wouldn’t do that, it’s not our way!" She growled. "I see no reason to lie." He shrugged. "Open the communications channel to the bridge." She instructed. "I want to hear what’s really going on up there." Two officers beamed onto the Gran’N’Nork bridge. They stepped through the fallen Klingons that were silent except for the muted sounds of their shallow breathing. One of them leant down and sprayed a hypo into Captain Klaag’s neck. Almost instantly his eyelids fluttered open and he began to stir from unconsciousness. "Klaag…" The man cooed at him. "Wake up Klaag." He grumbled and blinked but could barely move his muscles. His loathing for his captors could barely find expression beyond a vague growl in their direction. The man laughed. "I’m Commander Penfold." He told the Klingon. "We’re taking the new Bird of Prey, thanks very much for capturing it for us, you’ve saved us a lot of effort." "I… will… kill… you…" He managed with halting breath. "It will be a neat trick." His tormentor laughed again. "We’ve been monitoring your transmissions." The second officer told him with a snigger. "It seems your superiors are expecting you." "We’re taking the prototype and a copy of your logs and files." The Commander told him. "I suggest you slink back to your home like the spineless animals you are and tell some story of how you destroyed the ship and downloaded the schematics. I doubt you’ll be telling anyone about us as to do so would dishonour everyone on this floating scrap-yard." "You have no honour." The big Klingon spluttered. "That means a lot coming from a common thief and a murderer." Penfold smirked to his colleague. "What we do have is the prototype and we didn’t have to assassinate the entire crew to get it." His colleague told the Captain. "You made it easy for us." The Commander told him. "We set you up from before you even decided to violate our space with your foul stench." "Your people are spies!" Klaag groaned. "I should have killed them." "They’re not spies." The Commander laughed. "We rigged their ship with a few little trinkets we knew you wouldn’t be able to resist." "We took nothing…" Klaag grumbled ignorantly. "While your kind goes around beating each other with sticks we’ve been developing ways to deal with you quickly and easily." The Commander told him as his tricorder locked onto the computer core and began copying the files to the Oberth, a new class of ship that they had arranged to borrow for a few weeks under the guise of taking her for extensive field tests. "We were bait!" Ensign Peterson shook her head in confusion. "Who are these people?" Krogal asked, he raised his palms and glared at the weapon pointing at him. She sighed deeply and against her better judgement lowered the pistol. "I don’t know." She admitted. "They’re Human but they certainly don’t act like Starfleet." "How do you know I won’t kill you?" Krogal snarled as the barrels pointed to the floor. "Because there’s no honour in it." She told him calmly. "I’m not your enemy and you know it but now we know who is. There’s an old saying that the enemy of your enemy is your friend." "For now." She agreed. "So what do we do?" "We launch the fighter and take on our attackers." He slammed his fist into the metal bulkhead. "No." She told him. "We do this my way. We find out who they are and how they used us." "You would presume to tell me…" The man grimaced at the very suggestion. "Calm down." She snapped at him. "I’ve really had enough of your attitude. Your insane rampage has left your ship helpless and your crew anaesthetised by people who have been playing you all for fools.. Are you going to learn or die like an idiot?" "How dare you?" He glared at her, his face contorted in rage. "If you like I can beam you to your bridge and you can fight with a sword until you’re overcome by the gas." She sighed. "Or we can beam this whole fighter out into space and try to gain access to their ship." "Can you do it?" He grunted awkwardly. "Our transporters are not capable of such a thing." "Of course I can do it." She snapped at him. "I’ll apply a few engineering principals instead of shouting at it and threatening it with violence." A human officer stepped into the brig where Commander Peterson was searching the guard for his weapon. "Humans?" He cried out in relief as the man stepped closer. He was dressed in a grey single piece uniform that had no symbols except a rank insignia on the left sleeve and a communicator pad on the lapel attached to a small device on his belt. Otherwise the man held Starfleet issue equipment and carried a military phaser. "I’m Lieutenant Holding." He replied with a weak smile. "What the hell is going on? The Commander jumped up. "We beamed an anaesthetic on board, only Klingons are effected by it." He explained. "You’ve come to rescue us?" Graves beamed happily, pleased that his ordeal was finally over. "We didn’t think you’d still be alive!" The lieutenant told him with a raised eyebrow. "You almost sound disappointed." He joked. The man bent down at the fallen Klingon and grabbed the disrupter from under his huge motionless body. He pulled it free with a concerted effort. "So who are you?" The Commander asked, a slight sense that everything was not right had descended on him. "You haven’t heard of us." The Lieutenant told him flatly. "We’re called Section 31." "You’re right!" The Commander smiled weakly. "Are you part of Starfleet intelligence?" "Sort of." He nodded with a wry smile. "They captured us." He began. "They destroyed our ship." "We know." Holding told him. "We planned everything down to the last meticulous detail although a few things went slightly awry as usual." "You meant for this to happen?" He asked in surprise. "We filled the ship with little items of interest to a scavenger ship like this one." Holder explained lazily as he fiddled with the Klingon weapon. "There was a cargo crate with a special resin block sealed into it. It had a corrosive enzyme working on it until it finally dissolved into powder releasing a cloud of dust." "We found it." He replied, stepping away nervously, growing highly concerned. "The computer wouldn’t have been able to identify it and classified it as a risk as it was programmed to do." He continued. "The dust filled the ship and reacted to biological matter making you into a living tracking device, we knew the Klingons would board the ship too and it made tracking them very easy." "You knew that they were after the Romulan ship!" The Commander gasped. "You set them up!" "We let the Klingons do the hard work for us." He smirked, hefting the pistol. "Taking it from them couldn’t have been easier and they won’t tell anyone about this, it would make them look bad." "And me?" Commander Graves frowned with an impending sense of his own mortality. "Very unfortunate." Holder said as he raised the Klingon weapon. "This is nothing personal, your record will show that you were killed in a conflict with the Klingons and you’ll receive a posthumous honour for your service." The small Klingon ship hovered under cloak outside the rear of the Gran’N’Nork between the two large impulse exhausts. The plasma vents were masking the ship from the Federation sensors and the cloaking device was doing the rest. "I’m impressed." Krogal told her sincerely. "Don’t be." She told him. "I still have no plan." "We must act quickly before they move away." Krogal said thoughtfully. "If we manoeuvre keeping the Gra’N’nork between us and the enemy then they should not detect us." "I’m detecting thrusters firing." She warned urgently. "They’re moving away, the scout ship is towing them out of Federation space." "If I move the craft out of the exhaust plasma then they will detect us!" Krogal hung his head, their position seeming helpless. "From what I’ve been reading from the internal sensors then if they detect us they’ll kill us." She added. "Not exactly Starfleet are they?" Krogal grumbled. "No…" She agreed. "I’ve lost Commander Graves life signs, I’d only just managed to find him too." "They have raised their shields?" Krogal suggested. "No." She shook her head. "He’s vanished, he’s completely gone, there was an energy spike and then he was gone." "A disrupter weapon." Krogal told her as he checked her findings. "He has most likely been vaporised." She shot him a troubled glance. "I suggest we stay put." She rubbed her head thoughtfully, still shaken by the prospect of Peter Graves’ death. "We can analyse the warp trails later and get enough information to go to Starfleet." "I will die before I abandon my ship." He growled. "Have you got a better idea?" She shouted at him. "If so then I’m listening!" Merchant Captain John Graves sat back in his chair and waited. The faces staring at him were silent with surprise, even Haldo was speechless for once. "They killed your father?" Winston Morrow said finally with a note of sadness. "I never knew." "I think you’re missing the point." Blake told him. "I wish I’d told you years ago." Graves said with a deep breath of resignation. "The longer I left it the harder it became." "So what happened?" Katherine leant forward with her hands clenched together. "The Klingon fighter stayed put." He frowned. "They downloaded the logs from the probe and the ion-cannon mines and found out a little bit more about what had happened. The warp trails led them nowhere, even then Section 31 knew how to cover their tracks." "What happened to them ultimately?" Haldo asked. "Krogal was dishonoured." He began with a heavy heart. "To a Klingon that meant everything. The Captain blamed him for what happened, he said in his logs that he had betrayed them all by bringing spies aboard and working with them. He may have done it out of anger or to protect himself, he may even have believed it true." "And Ensign Peterson?" Haldo asked again. "She found out that her name had the potential to get her into a lot of trouble." He smiled inappropriately. "Section 31 found out that Krogal had escaped in a shuttle with her and began trying to track her down. Her career in Starfleet was over and she was left with nowhere to turn." Commander Morrow glanced around at the expression of the others and knew he was missing something. "So who are you then? What happened to your father?" Captain Graves looked at him with a tiny smile. "Peter Graves wasn’t my father." He told him flatly with a sigh. "Krogal was my father." "Krogal?" Morrow started in surprise. "But he’s a Klingon!" "Captain Graves is half Klingon!" Blake told him. "We discovered that when he was injured." "Well I suppose that explains why you like ramming things!" Winston mumbled, lost in his ruminations. "Krogal and my mother had nowhere else to turn." He began. "So they turned to each other. They hunted down Section 31 as best they could and they took on the Commander’s name as at least he was no longer being searched for. Krogal had surgery to change his appearance to look Human, as did I when I was born. Section 31 was bad enough but a Klingon blood warrant is much worse. He was afraid that his dishonour would pass to me and neither of us deserved it. They spent their lives chasing shadows in the hope of reclaiming their lives but in the end they just died twisted and angry with nothing left but thoughts of revenge." "My god." Commander Morrow shook his head, not sure what to make of any of this. "Hell of a life!" Haldo sighed. "I couldn’t risk joining Starfleet." Graves explained. "If I had I would have been discovered and in any case I needed the freedom to search for my enemies." "You could have told me!" Morrow glowered, a little hurt that his best friend had chosen to keep such a thing from him. "I didn’t and that’s a decision I regret more than anything." He told him. "I don’t see that you’ve done anything wrong!" Ensign Rogers turned towards Blake. "As far as I’m concerned what you tell the crew is up to you!" Blake agreed. "You haven’t broken any Federation laws, you’re as much a victim here as myself or anyone else who’s a part of our crew." "I have no charges to answer?" Graves smiled weakly. "Nothing I can see." Blake shook his head and smiled back. "Your story will stay here with us if that’s what you want but I doubt there’s a single crewman on either of our ships who would think any less of you if they heard it." "Haldo?" He turned to the gangly chief engineer. "I’d tell them!" He replied. "They think a hell of a lot of you. They wouldn’t care if you were a dubarian slime-worm… In fact I was half expecting that you were." "I’m glad I asked." Graves smiled. "We’re all in this together." Blake said finally. "I’d like to think that any member of this crew can feel safe here. We’re all victims of Section 31 in one way or another and we all understand that unfortunate things have happened to all of us." "Thanks, Captain." Graves nodded in agreement. "I’ve lived so long looking in the mirror at a face that didn’t fit, you’ve no idea how it is to finally feel like I belong."